DS Series dispensers are robust, large format platforms that handle all types of applications with ease. Ideal for dispense applications utilizing adhesive, solder paste, conductive adhesive, potting compounds, and more. DS Series provides the utmost in versatility and capability. It handles up to 3 different dispense pumps. This system toggles between each pump in a single program. DS Series systems are compatible with all GPD Global dispense pumps. A DS Series highlight - its large work area, up to 24" x 24" (610 mm x 610 mm), the largest standard platform in the industry. 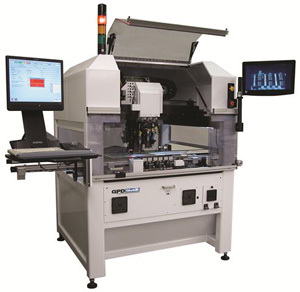 Available as standalone or inline, it can be configured to meet your production needs. 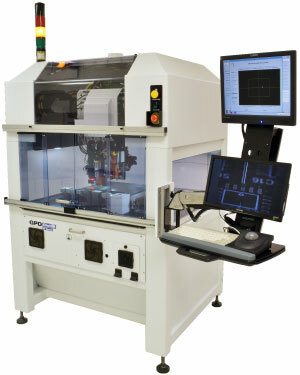 Standalone systems are configured with a flat worktable and board crowders that hold product to a registered location. 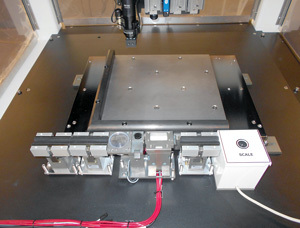 For additional support, work table may have vacuum ports or support custom fixturing. Inline configurations include an Entrance, Work Area, and Exit zone. 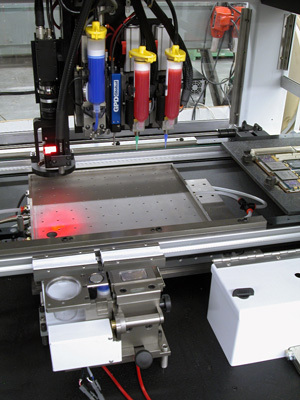 Each zone is configured with a board stop and product present sensors to track product through the system. 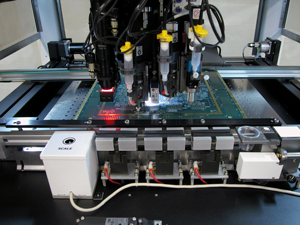 For applications requiring heat, the work table on standalone systems may be heated to 200° C. All three zones of a conveyor inline configuration may be heated via convection or conduction. Pumps may also have heat applied for fluid that perform better under an elevated temperature environment. Convection heating is very versatile and not subject to bottom-side board geometry. DS Series system construction is based on a welded steel frame that has been carefully manufactured for high accuracy manufacturing. 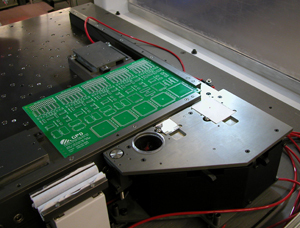 During assembly the system is subjected to a number of alignments and setups to ensure highest level of precision. After manufacturing, systems undergo contour mapping process for final touches on positioning capability. 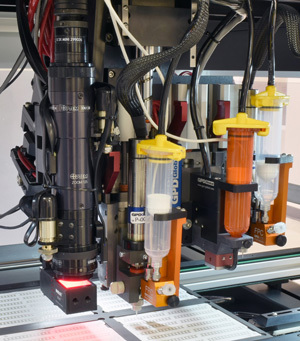 All DS Series models are well suited for multi-functional applications combining dispensing with light assembly / pick & place applications. A host of options are available to expand the capability of your system. DS9000 model has a work area of 18" x 18" (457 mm x 457 mm). Available in either an inline or stand-alone configuration. DS9100 model has largest standard work area in the industry of 24" x 24" (610 mm x 610 mm). Available in either an inline or stand-alone configuration. Maximizes pump dispense capability by constantly monitoring and adjusting pressure of fluid entering the pump to maintain optimal pump operating conditions. Compensates for variations in flow from fluid reservoir into pump - from full to empty. 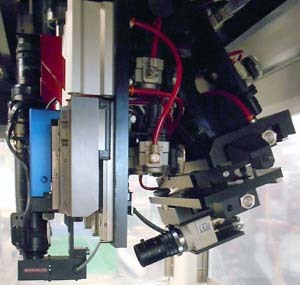 Also instantaneously adjusts to maintain constant feed during dispense operations of dots, lines, and area fills. Real time adjustment picks up where weight scales leave off. Displays dispense process at dispense tip on a separate monitor. Camera can look at all three tips. Programmable zoom and focus camera. Mass Flow Calibration - calibrates a pump to a programmed weight. To avoid nozzle contamination for multi-materials / liquid processes. To increase throughput for products that are consistently spaced in an array or carrier. A tandem mount holds two pumps of the same type at an adjustable pitch and offset. Both pumps dispense at the same time during a process. For product with an odd number of units, a single pump can be turned on/off during process.